Such a useful little thing, a nail, in its place. But when it is misplaced or missing, the results can be disastrous. Its presence on a road can cause havoc with your tires. A heedless sister once leaped onto a board with a nail, which went through shoe and foot. 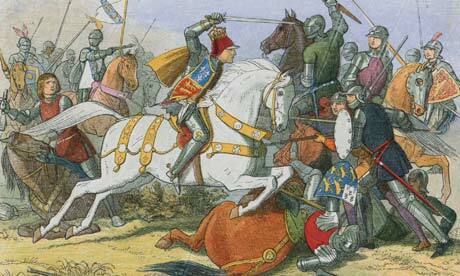 And as Richard III learned at the Battle of Bosworth Field in 1485, its lack can be even more dangerous. British history might have been very different had Richard's horse not foundered due to a lost shoe at the Battle of Bosworth, allowing Henry Tudor and his heirs to take the throne. And all for the want of a horseshoe nail! Nails were not mass-manufactured items in the Middle Ages; each was hand-forged for its original purpose and carefully saved and reused when possible. A century or so before the famous battle that cost Richard his kingdom and life, a pair of missing nails provided an important clue in the solution to a nasty murder in Mel Starr's A Corpse at St. Andrew's Chapel, the second in the author's series of excellent medieval procedurals. Unlike many mysteries set in the period, there is no need here for the author to develop elaborate and improbable reasons to involve Hugh Singleton in criminal investigations. As both Bailiff and surgeon he is the closest thing to both professional detective and forensic investigator available at the time. When Alan the Beadle is found under a hedge with his throat savagely ripped out and his shoes missing, Hugh suspects the death may not have been caused by a wolf. While he searches for the shoe thief, and his baited stakeout fails to catch a marauding wolf, Hugh himself is attacked in the dead of night––by men. Then his chief suspect is found dead, apparently stabbed in the back of the neck. There are no jarring anachronisms here; Hugh makes excellent use of the few and low-tech tools available to a medieval detective to solve the crimes, which involve inventive and misleading use of commonly available items. Who would think that the number of nails in a door hinge could provide an important clue to murder? "And she hated the North with the hatred of Jael/When the hot dry hands went seeking the nail." Jael was a biblical character likely raped by the leader of an invading force. 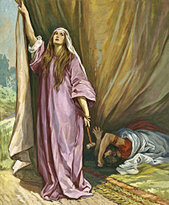 While he was sleeping she took a "nail of the tent" (possibly a peg? ), and hammered it through his temple into the ground. There were some strong, bloody-minded ladies in the Bible! In The Chinese Nail Murders, Robert van Gulik's protagonist Judge Dee also had to solve a nasty mystery involving nails. For those not acquainted with this charming series, Van Gulik was a Dutch sinologist who based his stories loosely on the cases of a famous sixth-century judge. They are written in the traditional Chinese mystery format and incorporate the legal structure of the period. If the judge––who was also the jury––decided a capital punishment case incorrectly, his own head, not merely his job, would be forfeit, so each judge had his own trusted team of investigators and officers who traveled with him to his assignments. The books are peppered with the author's own charming woodcut illustrations. Of course, in these days when coroners routinely do MRIs, nails as murder weapons aren't as useful. But they can still do a lot of damage. Just a little something to think about while having your holiday nails done! "For want of a nail" is a them of Kate Atkinson's Started Early, Took My Dog.